That is certainly a gun. Then you also see people getting shot on the ground trying to help an autistic kid get shot, or a confused large black man shot, some guy selling loose cigerettes choked out, 17 year olds running from the cops after stealing a car unarmed shot in the back running. 1) guy helping the autistic kid - no reason he should have been shot (tased maybe but not shot). 2) On the large confused black man . . . if you mean "hands up don't shoot fergusen", then he was completely in the wrong. 3) guy choked out selling cigs - that one is a gray area. he committed a crime and cops were trying to apprehend him, he resisted and the officer tried to subdue him with less than lethal force. Unfortunately either the cop had poor training on proper choke holds, he was too tired from struggle to perform correctly, or he just didn't know what he was doing. Any way about it, the guy would be alive today had he followed the instructions of police officers. As for this situation . . . it comes down to he didn't follow lawful instructions given by the police officers. That I can't answer because I wasn't there. All the evidence hasn't been put forward for the truth to come out. People are jumping to conclusions and adding fuel to already hostile fire. How do we know he was just sitting in his car? There are witness statements who said he had a gun waving it around. I agree it's bad but I won't say how I really feel about it. Rioting solves nothing, if anything it creates more of a divide and brings no one to your side or helps them to see your perspective. Peaceful protests where dialogue can be opened will help the agenda. IMHO. 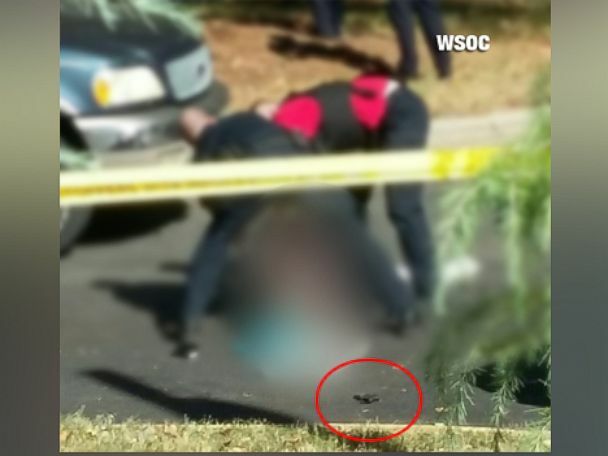 Proof positive that the police planted or shopped the weapon into the picture. There's only one reason to do that, they lied about him having a gun! Earlier and in this post you said that they planted the gun which would imply that you saw one in the video and now you are saying that it is photoshopped. How can both be true? So your contention is that she says "Keith come on out the car" then tells him NOT to get out of the car, then says "Keith get out the car" and then tells him not to do it? That's pretty curious don't you think? I think there's some serious mental gymnastics on display in this thread. Glad I'm not the only one who's noticed. For all those saying there was no gun in the video, if you stop the video on 1:48 you will see the gun in the video that the wife of Mr. Scott took.